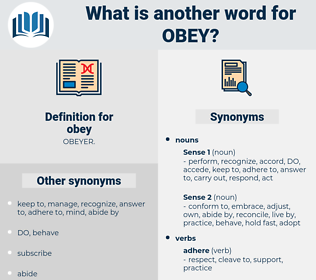 What is another word for obey? follow, abide, respects, heed, uphold, conform, enforce, execute, undergo, respond, listen, perform, govern. reject, deny, rebuff, refuse, resist, oppose, decline. dispute, disallow, argue, leave, forget, protest, ask, dissent, object, question, disagree, disapprove. overthrow, win, reach, overcome, attain. mock, scoff, pass over, withstand, pooh-pooh, brush off, flout, rebel, challenge, renounce, dismiss, revolt, shrug off, disoblige, break, dare, repudiate, deride, buck, overpass, breach, contest, wink, lead, combat, mutiny. I will serve you, and obey you. 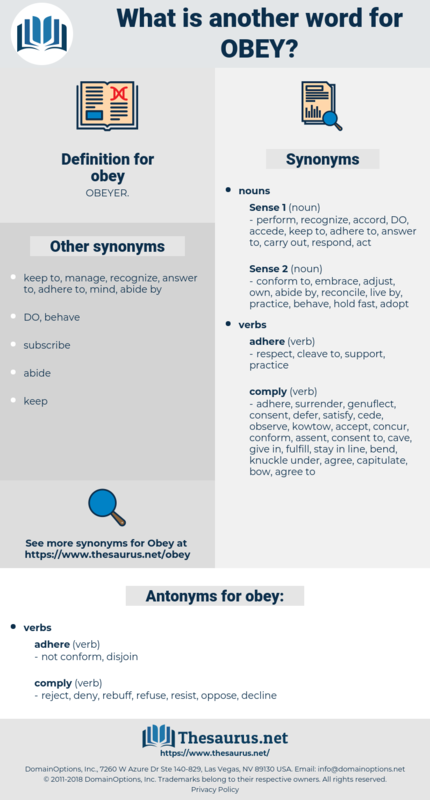 Very well; I will obey you. mind, comply, heed, listen, take orders, follow, abide by.